SBI announced 08 vacancies for these Specialist Cadre Officers in SBIL Kolkata, SBICB Hyderabad and SBICRM Gurugram. Contract Period: Initially 3 years with interim renewal every year based on performance. Renewable for a further period of 2 years. Contract Period Initially 3 years with interim renewal every year based on performance. Renewable for a further period of 2 years. Rs 25 lakh to Rs 40 lakh p.a. CTC Negotiable In addition to CTC, travelling expenses for travelling by taxi, air (economy class) in case of travelling on official duties and DA as applicable for the post. Such faculty will be permitted to take classes assignment outside on revenue sharing basis with prior approval from Dean SBIL/ Director SBIL/SBICB/SBICRM, whichever is applicable. The selected faculty will be allowed to utilize up to a maximum of 100 days p.a. in external teaching/consulting on a revenue sharing model. Interview: Mere fulfilling minimum qualification and experience will not vest any right in candidate for being called for interview. The Shortlisting Committee constituted by the Bank will decide the shortlisting parameters and thereafter, adequate number of candidates, as decided by the Bank will be shortlisted and called for interview. Merit List: Merit list for selection will be prepared in descending order on the basis of scores obtained in interview only. In case more than one candidate score the cut-off marks (common marks at cutoff point), such candidates will be ranked according to their age in descending order, in the merit. Candidates should fill the application carefully. Once application is filled-in completely, candidate should submit the same. In the event of candidate not being able to fill the application in one go, he can save the information already entered. When the information/ application is saved, a provisional registration number and password is generated by the system and displayed on the screen. For General and OBC candidates, Rs.600/- (Application Fee + Intimation Charges). For SC/ST/PWD candidates, Rs.100/- (Intimation charges only). 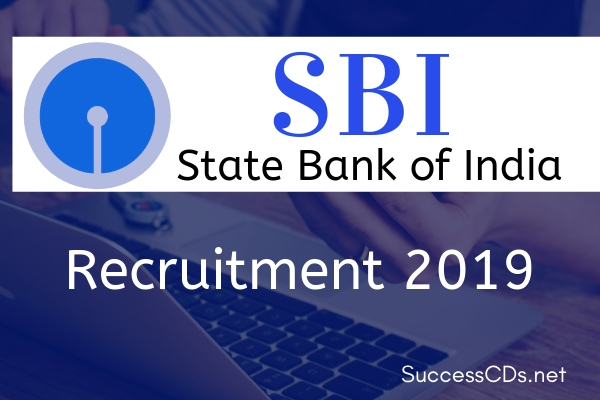 For more details regarding SBI Recruitment Notification 2019 logon to www.sbi.co.in. The information given above is based on the State Bank of India official advertisement.